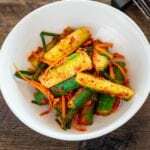 Learn how to make quick cucumber kimchi. It’s crunchy, light and flavorful. Just perfect for this summer! Cucumber kimchi (Oi Kimchi, 오이 김치) is a popular summer kimchi in Korea. My mom used to make either a quick cucumber kimchi (as seen above) or stuffed cucumber kimchi (oi sobagi, 오이 소박이) every summer. You might be wondering how these two kimchi are different? Essentially, both of them are cucumber kimchi. But one kimchi is serve with stuffed vegetables inside and the other one is not. 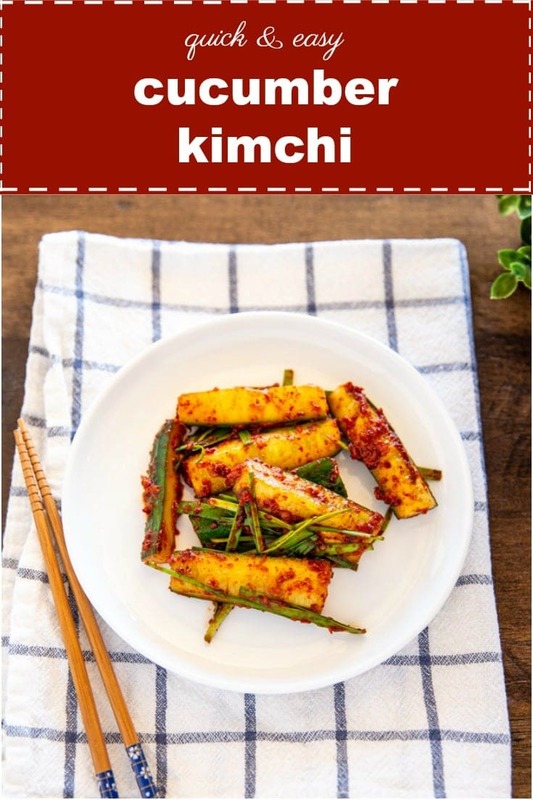 As a child, I always preferred just plain quick cucumber kimchi because I didn’t like the stuffings inside of the kimchi. I find these rather annoying because all I really wanted was simple, tasty and crunchy cucumbers. So if my mom made stuffed cucumber kimchi instead, I would spent a few minutes at each meal to take those stuffings out. Lol. How counter productive! Because it does take good time to stuff those things into the small gaps of cucumbers. Though, as a grown up, I love eating both styles of cucumber kimchi. They both are equally delicious and I particularly love the crunchy texture! Nonetheless, quick cucumber kimchi is a bit more convenient to make (obviously! ), so I’ve been making this a lot lately. 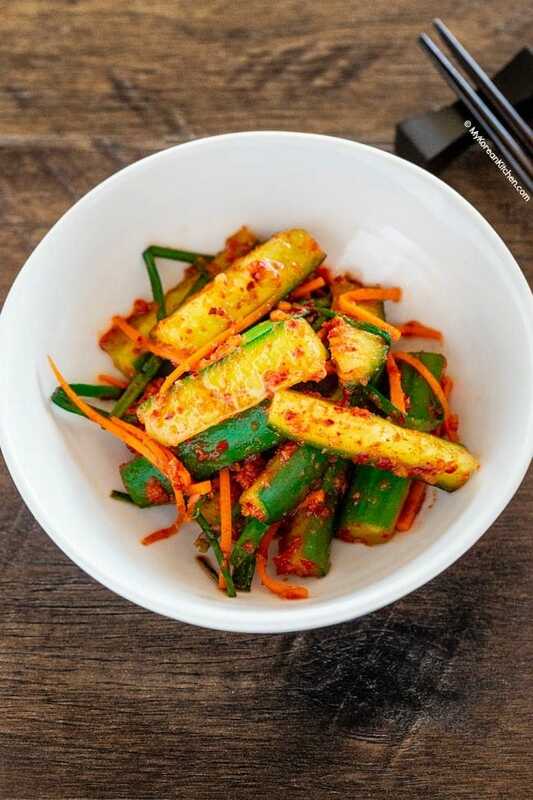 The cucumber kimchi is good with even just simple steamed rice, but it also goes wonderfully well with Korean BBQ. Hope you make it soon! P.S. If you like cucumber, try my other cucumber recipes! 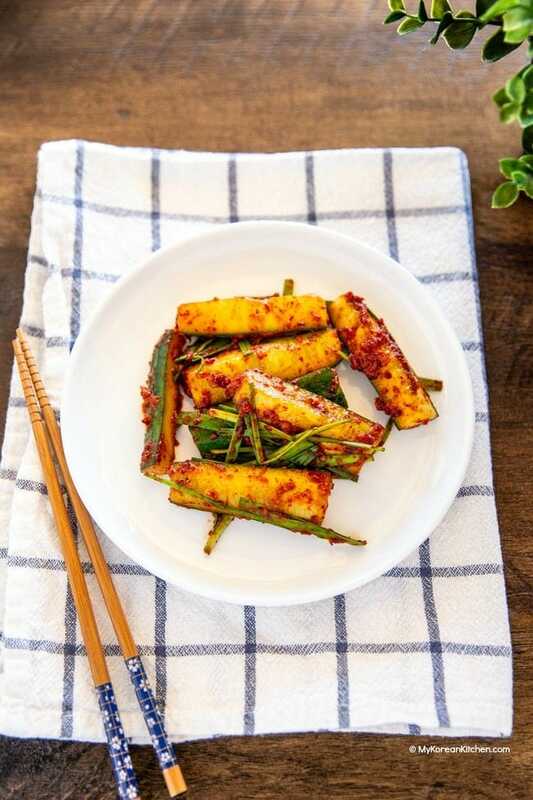 Spicy Korean cucumber salad (Oi Muchim) and Korean cucumber side dish (Oi Namul). 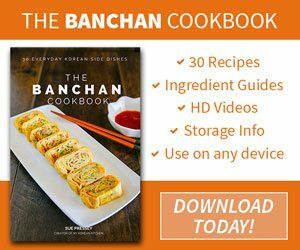 Also, if you want to learn how to make stuffed cucumber kimchi, check it out from my banchan cookbook. *If you don’t like using salted shrimps (1/2 Tbsp) and fish sauce (1/2 tsp), substitute them with 1 Tbsp regular soy sauce. 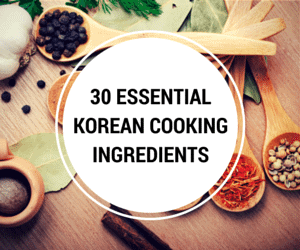 ***If you want to learn about Korean ingredients, check my 30 essential Korean ingredients list. 1. Cut off both ends of the cucumber. Divide the cucumber into 3 pieces then cross cut each piece length ways. You should end up with 4 to 5 cm (1.5 inch) length cucumber pieces. Put the cucumber into a large bowl then scatter the coarse sea salt around on top. Gently mix them so that the cucumber gets pickled evenly. Set it aside for 20 minutes. 2. 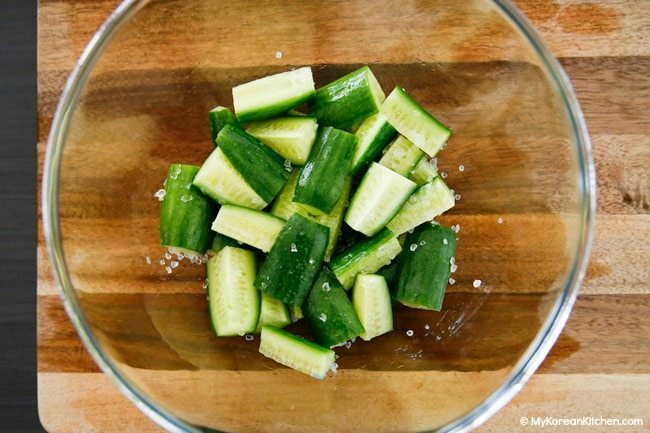 Gently brush off the salt from the cucumber then transfer the cucumber into a clean bowl. 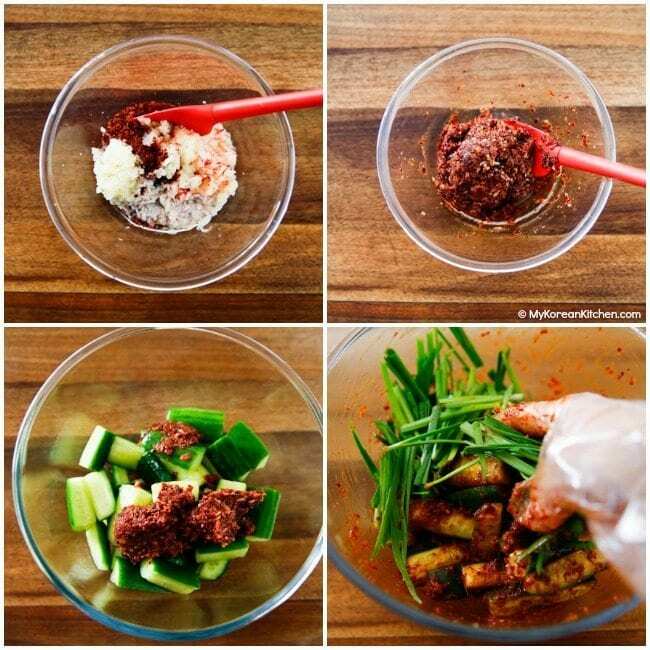 Pour in the kimchi sauce then mix them gently. (If using) Add the carrots and garlic chives then mix with the rest again. Transfer into a glass container and cover. 3. Keep it at room temperature for about 12 to 18 hours then move it to the fridge. Serve once chilled. 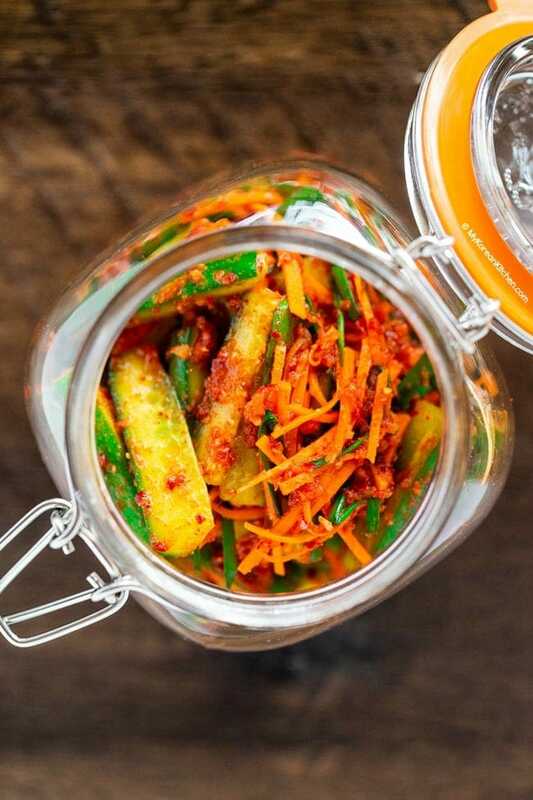 Store kimchi in an air tight glass container. Cucumber kimchi is best to be consumed within 7 days. The older the cucumber kimchi gets, the more water it loses. Then it can get mushy. Cut off both ends of the cucumber. Divide the cucumber into 3 pieces then cross cut each piece length ways. You should end up with 4 to 5 cm (1.5 inch) length cucumber pieces. Put the cucumber into a large bowl then scatter the coarse sea salt around on top. Gently mix them so that the cucumber gets pickled evenly. Set it aside for 20 minutes. Gently brush off the salt from the cucumber then transfer the cucumber into a clean bowl. Pour in the kimchi sauce then mix them gently. (If using) Add the carrots and garlic chives then mix with the rest again. Transfer into a glass container and cover. Keep it at room temperature for about 12 to 18 hours then move it to the fridge. Serve once chilled. * If you don’t like using salted shrimps (1/2 Tbsp) and fish sauce (1/2 tsp), substitute them with 1 Tbsp regular soy sauce. When ive seen cucumber kimchi on shelves at Asian markets they had liquid in them. In this photo I dont see any liquid. What are they soaking in? I’d say the liquid you’re talking about is naturally released from the cucumber. My photos above are taken straight after I made cucumber kimchi. In general, not much liquid comes out at that stage. The older the cucumber kimchi, the more liquid you will see. Thanks for the recipe. I just wonder if there will affect the flavor much if I use Vietnamese fish sauce other than Korean fish sauce? How are they different from each other? You can also use a regular (kikkoman) soy sauce as an alternative. If using a soy sauce, it may lack depth of flavor slightly but it still tastes good. 🙂 Hope this helps! I made the dish and I liked it! This looks great! How does this taste if it sits out for a few hours? Is it really strong tasting? Wanting to take it to a picnic tonight with the chicken skewers! If kimchi is left out at room temperature for too long, it will age faster. This cucumber recipe is very new to me. I’ve never heard something like that before. I do love eating kimchi especially the radish. I can’t wait to try this recipe somehow. Thanks for sharing. 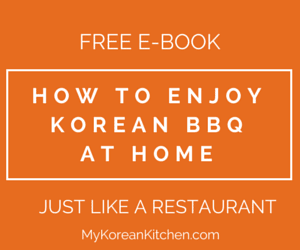 I have never made any Korean dishes – this will be a good one to start with! I love kimchi, and can’t wait to try making it! Hi. I am on a low salt diet. Can I omit the fish sauce? Thank you. Hi Lily, fish sauce is quite importance in this recipe. If you omit it, it will definitely lack umami flavor as well as necessary saltiness. So if you do omit, you might want to add some soy sauce or something equivalent. i have made it without fish sauce before, check out my facebook page! Hi. If you use more fish sauce and no shrimp, how much more fish sauce do you add? Also, Do you leave the kimchi at room temp with the lid on or off the container? Thank you. Hi Rose, I would just add 1/2 Tbsp of fish sauce (or slightly more if necessary). Also, the lid should be on. I love this recipe. Are garlic chives similar to regular chives? I don’t know where to buy garlic chives so I’ve just been using green onions. My mom used them too. Thanks Rose! I think they are different, but if I can’t get the garlic chives, I do use regular chives instead. Chives have more milder taste than garlic chives. Wow, Its looking delicious. i love kimchi. I would try it for sure. Your recipes are superb. Thanks for sharing. Loved the recipe. Is it as healthy as the regular kimchi? love your recipes! thanks Sue! as usual keep up the great work! I really liked this one, nice and easy, and good for the Summer. You are absolutely the best. I’m making the cucumber kimchi this afternoon.